New York City council member Ritchie J. Torres (left) with Bill Finger's stepson Steve Simmons and granddaughter, Athena Finger. Bill Finger (1914–1974), the long-unsung partner in the creation of Batman, has been receiving recognition of late, thanks to Marc Tyler Nobleman’s 2012 book Bill the Boy Wonder: The Secret Co-Creator of Batman (Charlesbridge, 2012), illustrated by Ty Templeton. 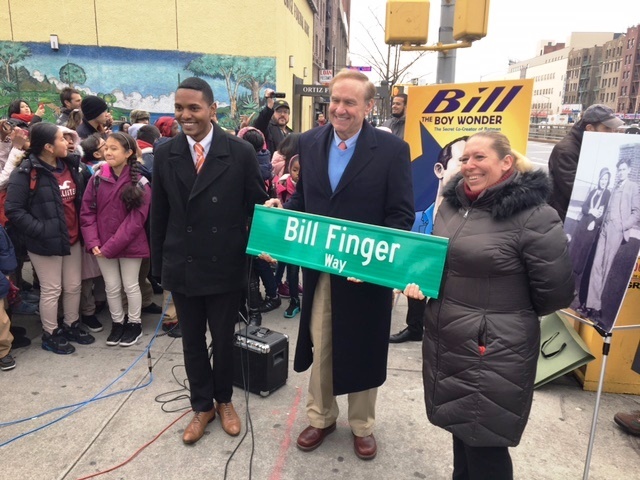 Elevating Finger’s status further, a Bronx, NY street was named after him earlier this month. Nobleman, along with fifth-grade students from P.S. 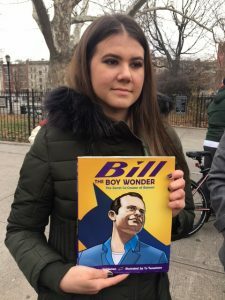 46 in the Bronx, city officials, and Batman fans, gathered at the intersection of the Grand Concourse and East 192nd Street to unveil a sign designating the thoroughfare "Bill Finger Way." Speaking at the event, Nobleman explained that Bob Kane was reluctant to share credit for Batman and was long thought to be the sole creator. “Holy fake news, Batman!” Nobleman exclaimed, adding that Finger, both a friend and collaborator of Kane, initially changed the appearance of the famed comic book character by adding a cowl and a scalloped cape. Nobleman recently appeared with Finger’s granddaughter, Athena Finger, in the Hulu documentary “Batman and Bill” (2017), exploring Finger’s contributions, including the naming of Gotham City and characters including Robin, Catwoman, Bruce Wayne, and Commissioner Gordon. In 2015, DC Comics formally agreed to give Finger equal credit as creator. The street-naming event took place in the shadows of another famous literary figure. Finger Way borders Poe Park, the site of a cottage where Edgar Allan Poe once resided. As young men, Kane and Finger, who both lived nearby, would meet in the park to discuss their superhero creation. Students’ drawings of superheroes were on display during the ceremony, showing a variety of creators and heroes. 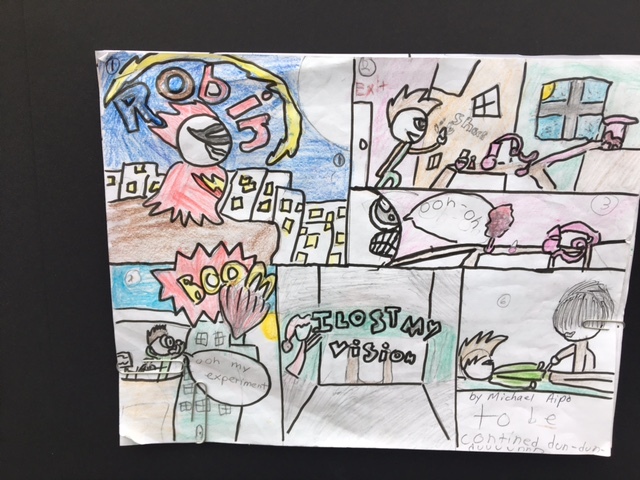 Fifth-grader Michael Aipo depicted Robin as his main character because he wanted to give the boy superhero, like Bill Finger, the credit he deserved. Scott Lundwall, 20, traveled to the event from Saratoga Springs, UT. It was her first visit to New York City, and she came specifically to honor Finger. Lundwall had become familiar with Finger’s work through Nobleman’s book. She was so moved by the story of intellectual theft that she made it the theme of her high school senior project. Athena Finger attended the ceremony along with Finger’s stepson Steve Simmons. Together, they helped city council member Ritchie J. Torres unveil the street sign. I am glad that Bill Finger is finally receiving the recognition that he rightfully deserves. Although Bob Kane created Batman visually, Bill Finger had done more for the character and Batman universe than Kane.